Birmingham Public Library: Where Does All The Money Go? Now that your 2011 tax returns have been filed (or at least were supposed to have been filed), you might find it rewarding to take a look at how your federal tax dollars are being spent. 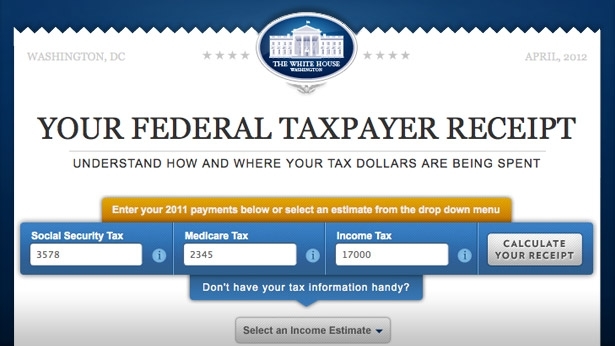 For the second straight year, the White House has placed on its homepage a tax receipt calculator. The idea for placing such a calculator on the homepage was first proposed by President Obama in his 2011 State of the Union address. It was the President’s intention to make the operations of the United States Government more transparent and accountantable to the American people. 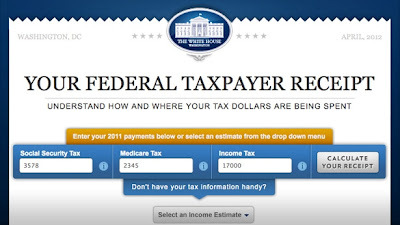 The tax receipt calculator helps him accomplish that goal by allowing taxpayers to find out how much of their money is being spent on the variety of services offered by the federal government. The calculator works like this: you enter the dollar amount that you paid into three categories of taxes—Social Security taxes, Medicare taxes, and income taxes—and the calculator computes the dollar amount that goes to each of twelve broad government service categories plus a thirteenth category for interest on the government debt. If you want a more service specific breakdown, you can expand the list to 40 categories. What if you don’t have your W-2 form handy with which to input your tax burden? Not to worry, because the Whitehouse has created 5 different precalculated scenarios that will allow you to see how people at various ends of the income spectrum are affected by the federal tax rates. For example, a single parent with one child who has an income of $35,000 pays at total of $2,741 in taxes. 52% of that total, or $1,441, is eaten up by Social Security taxes, while Medicare taxes account for $497 and income tax consumes the remaining $803. The largest share of the income tax goes to National Defense, $199.95, and the smallest shares goes to governmental responses to natural disasters, $3.21. As you might imagine, the White House is not the only entity that has created such a calculator. Third Way, a Washington D.C. based think tank that advances centrist positions on public policy issues, has one on their website that will break down your tax contribution to the federal government into over 200 different categories.